As you know, I recently decided to partake in IHG’s Into the Nights promotion. The only issue was that I didn’t have any planned trips coming up where I could stay at an IHG property and complete the requirements. So, I decided to do a mattress run… Well, two actually. Before this, I had never done a mattress run before, nor did I know how to. I knew the general concept of it, but knowledge from reading is much different than knowledge from participating, which meant this was a whole new world to me. If you’re in the same boat, don’t worry, that’s why this is the beginner’s guide to mattress running. On the other hand, if you’re an expert, please leave your tips in the comments. I’m sure you could figure this out just by reading the above two paragraphs, but for the sake of completeness, mattress running is the process of buying a hotel room(s) for the sole purpose of earning points and/or elite status. It makes no difference what hotel you’re staying at, what type or how many points you’re earning, or what status you’re running for; As long as you are paying for a hotel room to earn points or status, you’re mattress running. During my recent mattress runs, I got this question a lot. It was primarily asked by people outside the travel community, so I’m sure if you’re on this blog, you already know the answer. If not, the answer is Yes. I wouldn’t waste my money (and I’m sure no one else would) if it were not worth it. Mattress running is very similar to manufactured spending in the sense that you are buying points for as little money as possible. What makes people more hesitant to mattress run is the idea of spending a large sum of money all at once, while when MSing there are multiple purchases, but they are all small. To see the value in mattress running, it’s important to get past the amount spend and look at the cost per point. Let’s take a look at my previous mattress run (with rounded numbers) as an example. For my mattress run I spent $300, but I earned 25,000 IHG points and 2 free nights at any IHG property around the world. If I redeem those 2 free nights at a top-tier IHG hotel, which I plan on doing, each one would be worth 50,000 points. That means I bought 100,000 points for $300. In other words, I paid .03 cents per point. Now, let’s look at how much those 100,000 points would cost with manufactured spending techniques. The fastest/cheapest way to earn IHG points is to use an Ink card at Staples. Why? Because, Ink earns 5X at office supply stores, Ink earns 1% cash back from Visa SavingsEdge, and Ink earns Ultimate Rewards points which transfer 1:1 to IHG. Staples only sells $200 gift cards, so that would require 100, $200 cards. Purchasing 100 cards would cost $488.05 ($695 in fees minus the $206.95 earned from VSE), which means the cost per point is .48. That fee of $488.05 does not include any liquidation costs or the cost of your time, which would likely be quite a few hours. There are many assumed variables in the above examples such as the hotel value, the manufacture spending method, ect., however, the point is simple: in this case mattress running is much more lucrative. The process is simple, but for a first timer it’s nice to have it laid out, so here it is. Book the hotel room online, over the phone, or on the mobile app. If you are trying to earn points or status, make sure to do it through the hotel’s website or mobile app. Go to the hotel on the day you booked. For most reservations, you have to check-in in person. If you have a friend at the hotel, there’s a chance they could check you in over the phone to save a trip, but for your first time, that’s unlikely. You can add anybody to your reservation, which means you could have a friend, family member, or hobo check-in for you. If you don’t plan on using the hotel room, try to find someone (you trust) who will. No reason to leave a room empty if someone can benefit from it. If you plan on mattress running at a certain hotel many times, try to make friends with the employees. You have a better chance of being able to check-in over the phone that way. The ownership likely won’t care if you are mattress running, because they make their money regardless of whether you actually stay in the room or not. Make sure to actually check-in. If you make the reservation and don’t check-in, you will not get credit for your stay. 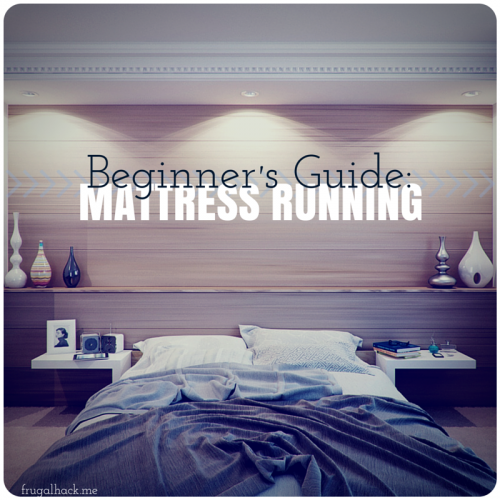 If you have any questions regarding mattress running, let me know.